The first 20 minutes of this year’s silver screen adaptation, The A-Team, is a microcosm (or synecdoche, for all you literary types) of the entire movie. Each character is introduced doing whatever it is they do best, and what they will continue to do for the rest of the movie. Hannibal, played here by Liam Neeson (who appears to have gained about 30 pounds since I last saw him in the excellent Taken) has planned the daring rescue of (Bradley Cooper’s) Faceman from an unspecified Mexican generalissimo. Meanwhile, B.A., played by Quinton “Rampage” Jackson (some Ultimate Fighting Championship guy I’d never heard of until this movie came out) beats up a bunch of guys and retrieves his prized custom van. B.A. 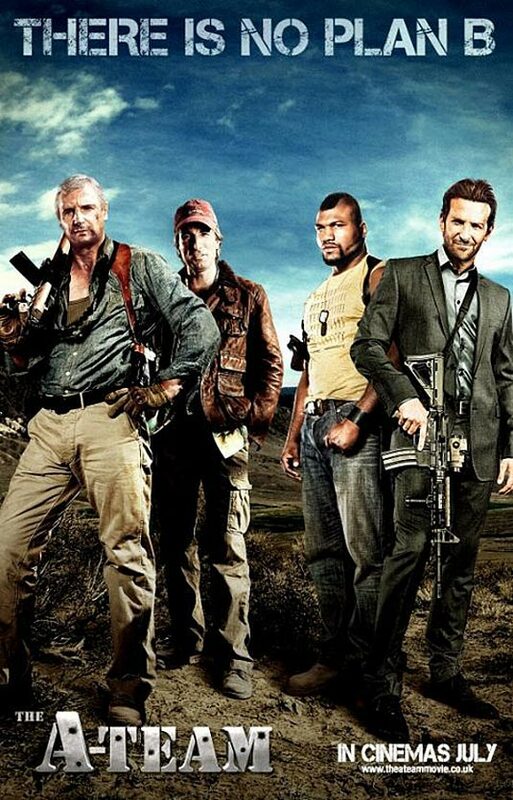 and Hannibal team up to rescue Face, and then proceed to the local psychiatric hospital to recruit Murdock (District 9‘s Sharlto Copley), who helps them escape in a beat up ambulance helicopter. There is a self-awareness peppered across the sillier action sequences, as though the point is not to be hyper-accurate, but to just have fun with it. (It’s the A-Team!) The utter dismissal of many of the laws of physics would be laughable in most other movies, but it works here. The action sequences are fantastic (in the most literal sense); at no time is the audience meant to believe that stuff like this is possible, yet it remains thoroughly entertaining. For example, the team manages to “fly” an air-dropped tank toward a potentially softer landing by firing the cannon in the opposite direction. This ends up being a lot more exciting (and yes, funnier) than it sounds. Contributing further to the high overall quality of this movie is the top-shelf cast. Though I was skeptical when some of the casting decisions were announced, Liam Neeson does an excellent turn as Hannibal, and Bradley Cooper is easily as slick and beguiling as Dirk Benedict ever was. Replacing such a unique personage as Mr.T in the B.A. Baracus role would intimidate any casting director, but “Rampage” Jackson did a fine job, especially (and surprisingly) in his few dramatic scenes. Patrick Wilson (Watchmen‘s Nite Owl) drips with hubris as the shifty CIA agent on the team’s trail. However, it is Sharlto Copley’s “Mad” Murdock that is the stand-out performance. I loved Copley in District 9, and was surprised to hear that it was his first acting role. Here he one-ups himself as he hides his South African accent under layers of unidentifiable, vaguely-Texan dialect and plays Murdock with frenzied relish and flawless comic timing. His one-liners and improvised, rambling chatter had me roaring. In an obligatory montage scene, in what is perhaps my favorite bit in the movie, Murdock paints his face blue and affects a side-splittingly hilarious Braveheart spoof. It’s only 3-5 seconds of screen time, but I could watch it over and over again. Catch it in theaters while you can (it was released June 11). If not, come on over to my place when it comes out on Blu-ray, as I will definitely be purchasing a copy. Instead I have only to observe that this is one remake where it seems the directors made the right decision: keep things as ridiculous as possible. I hope thousands and thousands of high-power rounds are expended without ever hitting a single human being, just like every single episode of the actual show.